Irregular palm-shaped fronds make fern trees immediately identifiable. They are tropical and subtropical plants that will often pull nutrients and water directly from the air, meaning soil requirements for the tree are minimal. They are found mostly in the southern region of the United States. Any fern that has a trunk elevating its leaves above ground level is a fern-leaved tree. Tree ferns belong to the Cyatheaceae and Dicksoniaceae families. Botanists look at the plants' organs to help identify and categorize the plants. The shape of the leaves and the type of stem are the most important visual factors for these types of trees. Tree ferns are nonflowering plants that are easily transplanted from the soil as long as the roots are kept intact. Tree fern fronds are very large leaves and generally divided, otherwise described as multiple-pinnate. They can be rough to the touch, with tiny hairs growing from the base of the plant. When the tree reaches a certain level of maturity, the young fronds will extend from the stem in coils, uncurling with age. Their leaves are wide and flat, designed to minimize moisture loss and maximize the photosynthetic surface area. Unlike many other trees, tree ferns reproduce through the use of spores. This allows the plant to achieve widespread distribution into the windstream. Unfortunately, because the chances of reproducing are typically low, the plant can quickly become highly localized. 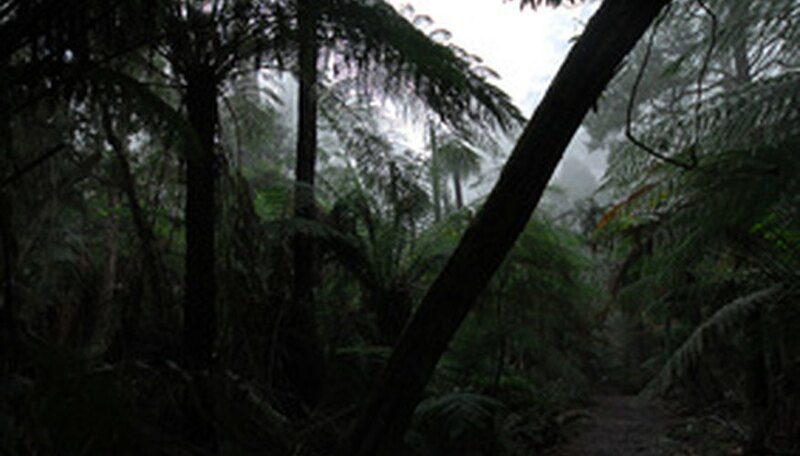 Tree ferns that are very localized are easily threatened by the devastating effects of deforestation. When botanists cannot identify a plant simply by looking at it, they take a look at the cellular structure of the plant. The way cells are organized within the stems, leaves and roots of the tree can be unique with tropical plants. Spores are unique cells not commonly found within trees but are used reproductively by tree ferns.